Today the Pluto-bound New Horizons spacecraft passed the halfway point between the orbits of Uranus and Neptune, zooming past another milepost on its historic trek to the planetary frontier. New Horizons, launched in January 2006 and set to visit the Pluto system in July 2015, is the first spacecraft to cross this distant region since NASA’s Voyager probes in the late 1980s. New Horizons is now more than 25 astronomical units from Earth – one AU being the distance between the Earth and sun, 93 million miles or 150 million kilometers. New Horizons crossed the orbit of Uranus on March 18, 2011. It’ll pass the orbit of Neptune on Aug. 25, 2014 – exactly 25 years after Voyager 2 made its historic exploration of that planet. The distance between the orbits of the two gas giants is about a billion miles. 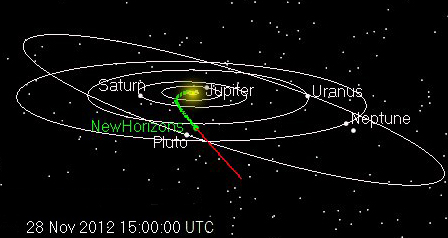 So far, New Horizons has traveled more than 2.3 billion miles since launch. Pluto itself is a “mere” 711 million miles (1.14 billion kilometers) away from the spacecraft – nearly eight times the distance between Earth and the sun – and currently closer to New Horizons than any other planet. New Horizons remains healthy and on course toward Pluto and Kuiper Belt beyond. Mission operators at the Johns Hopkins University Applied Physics Laboratory in Maryland received a “green” beacon transmission from the craft on Nov. 26, indicating all systems were normal. The Solar Wind Around Pluto (SWAP), Pluto Energetic Particle Spectrometer Science Investigation (PEPSSI) and Student Dust Counter (SDC) instruments are currently collecting data while most of New Horizons cruises in electronic hibernation. “This continues to be an essentially textbook cruise to the very frontier of our solar system,” says New Horizons Principal Investigator Alan Stern, of the Southwest Research Institute in Boulder, Colo. The New Horizons mission operations team will wake the craft in early January for a quick systems checkout, which also includes uploading a software update into New Horizons’ main computer and downloading science data from SWAP, PEPSSI and SDC.